For dinner last night, we decided to eat out and I had heard about Applebees new under 550 menu so I wanted to try it out. I decided to get the Spicy Shrimp Diavolo. It was....eh....ok. I wasn't impressed. The sauce was good, a little on the spicy side but not too bad. It just ended up being way to much pasta for me. Not something I would order again. 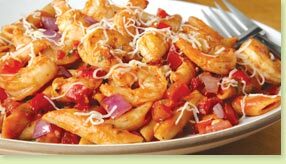 According to the Applebees webite, the dish is 500 calories.